“An unintended military escalation through miscalculation continues to be one of the most underappreciated risks in our view,” Croft and her team warned. The U.S. has warned other countries that they too will be hit by secondary sanctions if they buy Iran’s oil. The sanctions are expected to lead to export losses for the Islamic republic that surpass 1.2 million barrels a day (mb/d) during the first quarter of 2019. Well, the idea of “unintended military escalation” is consistent with my long held view that there would be “unintended consequences” for various policies and actions from US President Donald Trump. Will there be “military escalation” in the region? Elam looks to be a reference to at least some in Iran. Kir is of interest as it has several possibilities. One is that the Bible tells that after Tiglath-Pileser king of Assyria took over Damascus, he moved Syrians to Kir. While this does not mean that Kir must (or must only) be a reference to Syria, the fact that Syria is an ally of Iran is interesting. Some believe Kir is an area in the south of Iran, while others suggest closer to the Black Sea. The Bible tells of a time when Kir will be destroyed (Isaiah 15:1b) and also says that Syria’s capital Damascus will be destroyed (Isaiah 17:1). So, yes, there will be military escalation in the region. Donald Trump has stated that he wants to eliminate or at least change the “nuclear deal” with Iran (Wilkinson T. Trump’s plans to scuttle or amend the Iran nuclear deal remain a work in progress. Los Angeles Times, November 14, 2016). He also might be more willing than the Obama Administration to trigger enforcement provisions if he feels Iran has violated portions of the agreement. Iran would not like to see either of those actions and continues to show some of its nuclear ambitions: after Donald Trump’s election, Iran declared it would pursue development of nuclear powered ships (Norman L. Europe Hopeful Trump Will Stick With Iran Nuclear Deal. Wall Street Journal, December 13, 2016). Because Bible prophecy indicates that it will be primarily Arabic nations that support the final King of the South (Daniel 11:40-43; Ezekiel 30:1-8), though with some (probably temporary per Daniel 11:25-26) support from Turkey (and possibly Pakistan), it is not biblically possible that Iran can truly be the leader of the Islamic world as it seems to want to be. Also, because it is basically due east of Jerusalem, Iran should not be considered to be a candidate to be the final ‘King of the South’ of biblical prophecy. Despite its posturing and relative military strength, Iran will be somehow effectively neutralized (cf. Ezekiel 32:24). This could perhaps be from an attack involving Israel and/or internal civil unrest — this could also include electromagnetic (EMP) or similar weapons used against Iran (Jeremiah 49:34-39). 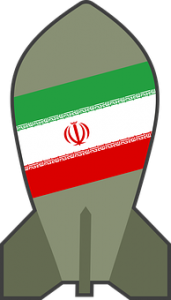 It is of prophetic interest to note that the small nation of Israel is prophesied to one day be attacked by some that seem to have connection to Iran (Isaiah 22:1-14). Iran may decide to strike out against Israel, and possibly Jerusalem (cf. Isaiah 22:7-8) if a Trump Administration and/or Israel takes actions it does not like. Iran has weapons that can cause damage. Furthermore, the U.S.A. itself (as well as is the State of Israel) is vulnerable to EMP type attacks and/or items such as biological weapons, chemical weapons, terrorism, nuclear weapons, dirty bombs, etc. because of a conflict involving Iran, Syria, and/or others. Could Iran and Syria combine to attack the state of Israel? The media has placed hopes on Russia to prevent such conflict. Some Protestant and Jewish sources point to Russia as an ally to Iran to invade Israel to fulfill Ezekiel 38. Can explanations based on Ezekiel 38 possibly come to pass before Jesus returns? How does it involve silver and gold? What does Ezekiel 38 really teach about its time period? Are there prophecies in Isaiah 22 that point to the possible destruction of part of Jerusalem by an alliance of Iran and Syria? What about Isaiah 17 and the destruction of Damascus? Could Jeremiah 49 be referring to destruction coming to Iran? Dr. Thiel addresses these issues and more. Here is a link to that video: Iran & Syria vs Israel? Russia? There will be military escalation in the Middle East. Yes, decisions and statements by US President Donald Trump will be a factor–though not the only one. There will also be many more “unintended consequences” of his policies and practices. This entry was posted on Wednesday, September 5th, 2018 at 3:00 pm	and is filed under Prophecy.